Easy single rise rolls. Kids love them because of the little “hats” you eat first. You will love them because they are delicious! In a large mixer bowl, combine 3 cups flour, sugar, salt and yeast. In a small saucepan, heat milk and butter until milk is warm. Warm means that when you dip your finger in the liquid, it will feel slightly warmer than you. You are 98.6° F. You will want to shoot for about 110° F – that will be warm enough. If it feels hot, let it cool a bit as heat is one of the few things that will kill the yeast. The butter doesn’t need to melt and probably will not. Add eggs and warm milk to the flour mixture. Blend at the lowest speed until just moistened. Then, beat at medium speed 3 minutes. I like to set the timer as 3 minutes is longer than you think when you are holding a heavy mixer. By hand, stir in remaining flour to form stiff dough. Put the dough on a floured surface and knead until it is smooth and bounces back when lightly pressed. This will take approximately 2 – 3 minutes or so depending upon how firmly you are able to knead. Divide dough into 18 equal parts. Remove about 1/5 of each ball of dough. Shape all 36 pieces into smooth rounds. You will have 18 big and 18 small rounds. 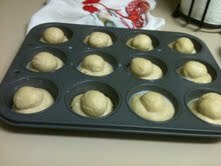 Grease or spray muffin tins with Pam and place the large balls in the bottom. Using your thumb, make a deep indentation in the large balls and place the smaller balls in the indents. There is no need to press in, just set it there. Cover with a dishcloth, place the pans away from cool drafts, and let rise until doubled in size in about 45 minutes to an hour. Brush tops with milk. Bake at 350° F for 20 minutes or until they are a beautiful golden brown. These are best served piping hot, but work beautifully when made ahead and heated in the oven for a few minutes. Alternatively, bake them at 275° F until they set but are not yet browned, cool, and set aside. Bake them at 35° F until they brown and you are good to go with your own home made brown and serve! This recipe is from my stained pages stuck together 1968 Pillsbury Bake-Off Breads cookbook. The directions include my comments on process and a few minor changes, such as the number of rolls. If you can find this cookery book at a garage sale or eBay or amazon or wherever, it is worth every penny. 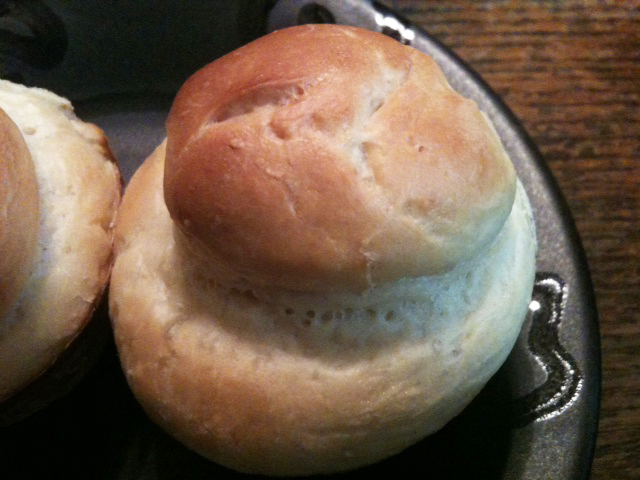 This entry was posted in Bread and tagged brioche, easy, rolls, Yeast. Bookmark the permalink.